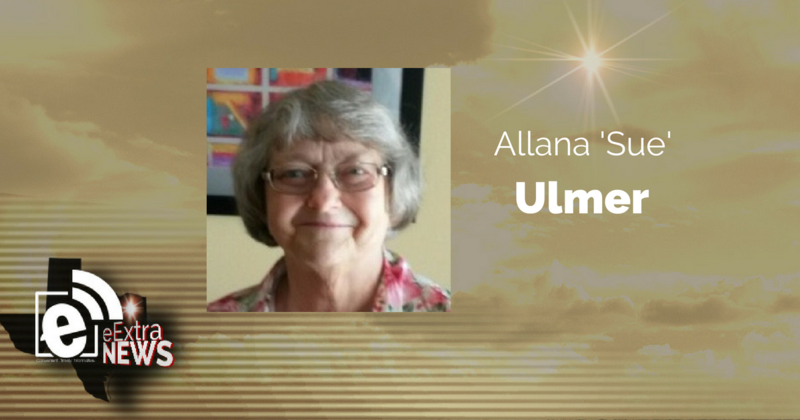 Allana “Sue” Ulmer, aged 73 years old, went to be with her Lord on August 13. She was born on December 30, 1944, and was preceded in death by her Husband Norman S. Ulmer, Jr., father Rudell V. Killgore and mother Margie Killgore. She was an active member of the Old Concord Baptist Church for over 40 years. She was loved by many and constantly doted on her two sons. Often spending time with her sister and brother-in-law, she also devoted attention to her much-loved cat and could often be found doing her favorite pastimes reading and assembling puzzles. Sue is survived by her sister Linda O’Dell (husband Dennis O’Dell) of Commerce, Tx. and her two sons Norman Ulmer III of Aurora, Colorado, and Vincent D. Ulmer of Greenville, Tx. As well as six grandchildren. There will be a Visitation on August 17 from 6 to 8 p.m. at Lynch Funeral Service in Greenville, Tx. Memorial Service will be on August 18 at 2 p.m. at Old Concord Baptist Church in Greenville, Tx.